The Omega Cookie packs potent nutrients with delicious flavors like chocolate chip, cranberry, and ginger raisin. Boasting the wholesome ingredients of 2000 mg of EPA/DHA omega-3 from fresh, full-spectrum cod liver oil, gluten-free oat fiber, calcium and vitamin D, this Superfood Champion makes a filling breakfast, travel meal, or sizeable snack. For optimal benefits, eat one to two Omega Cookies every day as a breakfast meal replacement or hefty snack. The Omega Cookie contains only all-natural and fresh ingredients. 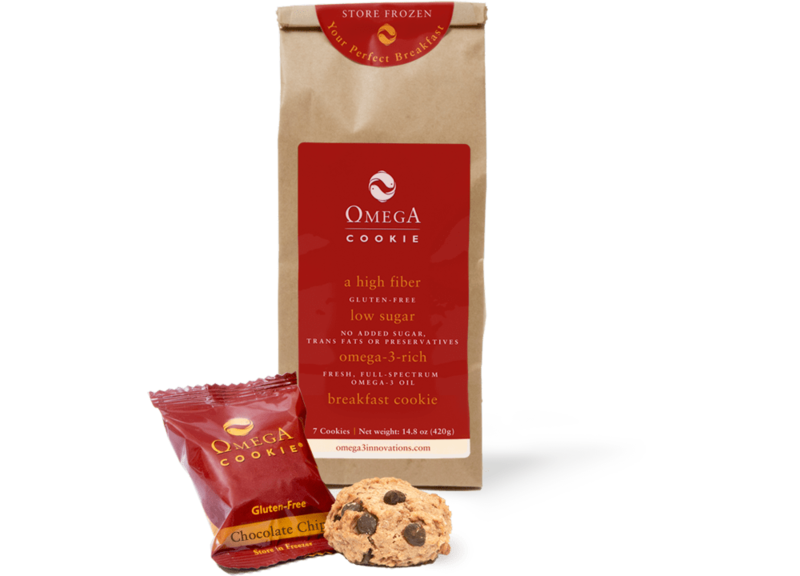 While there are no preservatives in the Omega Cookies, they have a shelf life for up to 10 days at room temperature. For optimal freshness, however, store the cookies in the freezer. In the freezer, the Omega Cookies will keep for up to four months. The omega-3 helps keep the Omega Cookie soft, so you can enjoy it straight out of the freezer. If you feel the cookie is too hard, let it thaw on the counter for five to ten minutes before consuming. Ingredients: Gluten-free oats, orange juice, purified cod liver oil, semi-sweet chocolate chips (sugar, chocolate, cocoa butter, milk fat, soy lecithin, vanilla, milk), egg whites, white rice flour, applesauce, honey, water, banana puree, extra virgin olive oil, vanilla extract, calcium carbonate, cinnamon, vinegar, beta glucan oat fiber, baking powder, xanthan, baking soda, vitamin D3. We’ve gone to great lengths to make Omega Cookie a nutritional powerhouse. Besides delivering 2000 mg of EPA/DHA omega-3, each cookie is chock-full of other essential nutrients: five grams of oat fiber, 800 IUs of vitamin D3, and 350 mg of calcium. What the Omega Cookie does not contain is just as important to us as what it does. We’ve eliminated all processed ingredients from the baking process, including trans fats, high fructose corn syrup, preservatives and color additives. People with food sensitivities can also rest assured, this is a certified gluten-free cookie. It took us over seven years to develop the patented technology that would allow us to bake clinical doses of omega-3 into a cookie without it tasting fishy. But how did we know the omega-3 still delivered the same benefits after being baked? Lots of research. We assessed bioavailability by measuring the changes in the omega-3 index and blood lipid levels. We also conducted studies with schools, looking at how eating an Omega Cookie daily impacted focus and performance. With 220 calories per cookie, we’ve designed the Omega Cookie as a satisfying breakfast meal. But since each Omega Cookie is individually wrapped, you can also use it for other purposes. Enjoy as a smart travel meal when you’re on the go or as a pre- or post-workout snack. Omega cookie is tasty, healthy, and convenient snack . I take one with me when I go to work. Love it! I just received my package of the chocolate chip Omega cookies and they are delicious. When I ordered them I really didn't have high hopes because most gluten-free products that I've tried are not very good. I was happily surprised though. They also passed the kid test. Both my son and daughter love them and ask for one every morning since we received them. They are so moist and super filling. I love that they are so healthy and I will definitely be placing another order. Excellent way to sneak omegas past my family. They taste as good as any regular cookie with a sneaky, healthy surprise. The citrus flavored oil is amazing as well. I’m a vegetarian other than these oils so I am only interested in making this exception for the best product on the market, which I believe this is. I originally hesitated to purchase these cookies because, since I am always watching my calorie intake, they have a high caloric number. However I have learned that not only are they tasty and healthy, they are quite satisfying. My brother has taken to raiding my stash in the freezer as well. I am thrilled to have discovered these little gems! I swear by these cookies! I used them initially to manage many of my menopause symptoms and was amazed at how effective they were. I continue to use them now for dry-eyes! If I skip a day or two, I can tell immediately. These really do work! I also encourage my two teens, who both have learning challenges, to use them. My 15 year-old son has balked due to their texture (they are both sensory sensitive), but my 13 year-old daughter has acquired an affection for them and eats them at least 3 - 4 times a week as a treat at lunch or between classes. We haven't done an "official controlled experiment" or anything, but her brain health has dramatically improved. She has had straight A's all year! Who knows what other factors have contributed to this positive outcome, but she now swears by them too! Love these cookies! I travel a lot on business and they are the perfect nutritious not-too-sweet snack for travel. I also use them as a filling breakfast replacement when I don't have time to fix something. (Easy to eat in the car on the way to a 'too-early' appointment.) I stock up and keep a few bags in the freezer - but I always keep 1- 2 cookies (individually wrapped - nice!) in the fridge so they are thawed and ready to consume. My favorite healthy, nutritious snack! I LOVE the chocolate chip Omega cookies and appreciate being able to grab one when I don't have time for breakfast or need a 'pick me up' in the late afternoon. They have become quite addictive :) and I would highly recommend such a healthy habit. I find that they help me to be regular and give me good energy. My 88 year old mom loves them too and I made sure to bring an extra package on my recent visit. Dear Chris, We're delighted to hear you had good success with the Omega Cookies. That's wonderful news, and also we appreciate you sharing this positive review with us. For your daughter, you might consider trying the Omega Heaven chocolate-covered cookie. Some kids, especially the younger ones, tend to like those more than the chocolate chip Omega Cookie because they taste a little sweeter and they are also a little smaller. Wow, it works, I bought them for my daughter, she said it was ok. But I had two cookies in two days and oh boy, I was in the bathroom. Cookies work because I had them personally. Very tasty , fresh when received. Very yummy as well. I recommend it, No I have to keep on my little one to eat them. Wish me luck with that, Very positive. My son is allergic to nuts and diary, so the cranberry cookie is a perfect option for him! He'll be 3 this year and love his cookie treat, loaded with great nutrients. While traveling, eating healthy food can be a challenge. Hotel and conference "free breakfasts" can be sketchy, especially continental breakfasts. I pack several Omega cookies in my suitcase with packets of organic oatmeal to both take up the slack and give me the Omega 3s I need. We have just received our shipment of the assorted cookies in all 4 flavors and WOW! We have 5 members of our family and each tried one each of the flavors. All are really moist, tasty and satisfying. The portion size is really generous and fills you up. I am happy to know my kids are having a fish oil laden snack rather than empty calories. Highly recommend!